Whether you’re listening, dancing, or channeling your inner pop star and singing along, there’s nothing that livens up a party quite like a great mix of tunes! 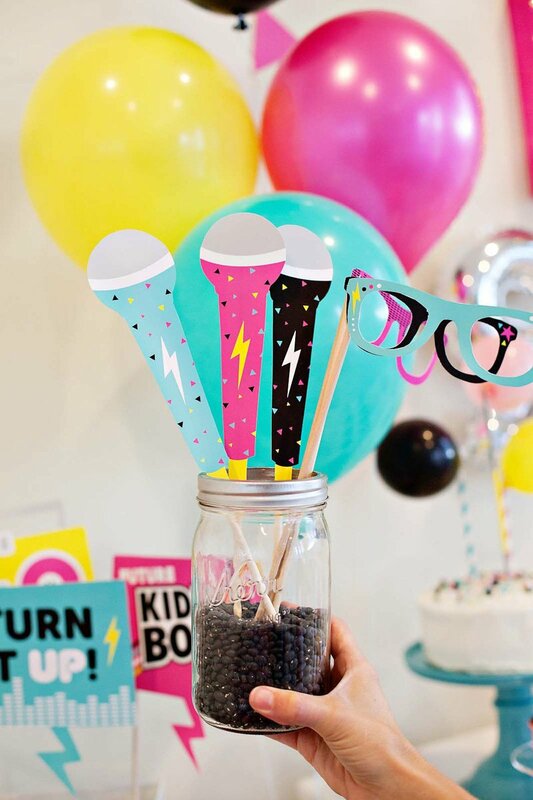 As part of their all-year-long birthday celebration, I was asked to dream up and share some creative ideas for throwing the Ultimate KIDZ BOP Pop Star Party at home! I wanted to keep things very upbeat and playful, and was inspired by the fun, summery color palette in their new brand new album. Note: these sections start after the first 6 images, which give a good overview of the entire party. Clicking on a link will jump you directly to that section. 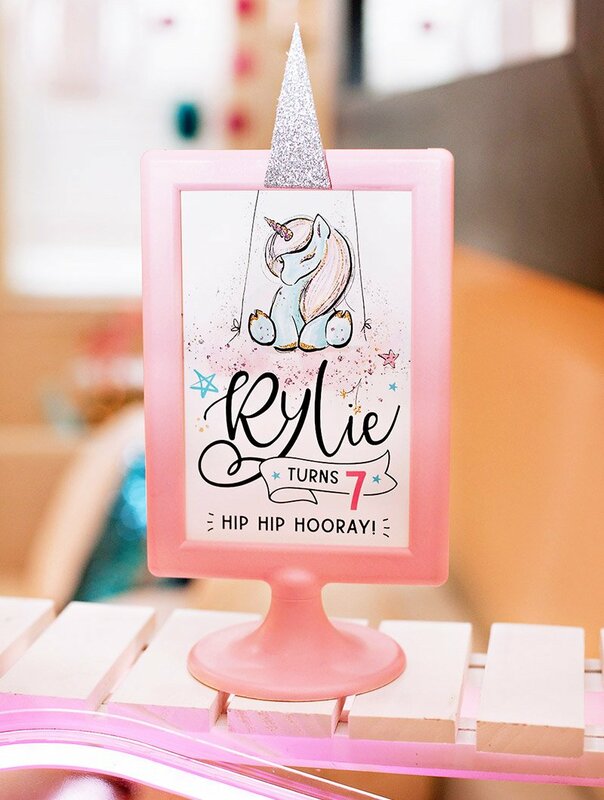 I’m also including a TON of Free Pop Star Printables (including this fill-in invitation) to make things extra easy to recreate! 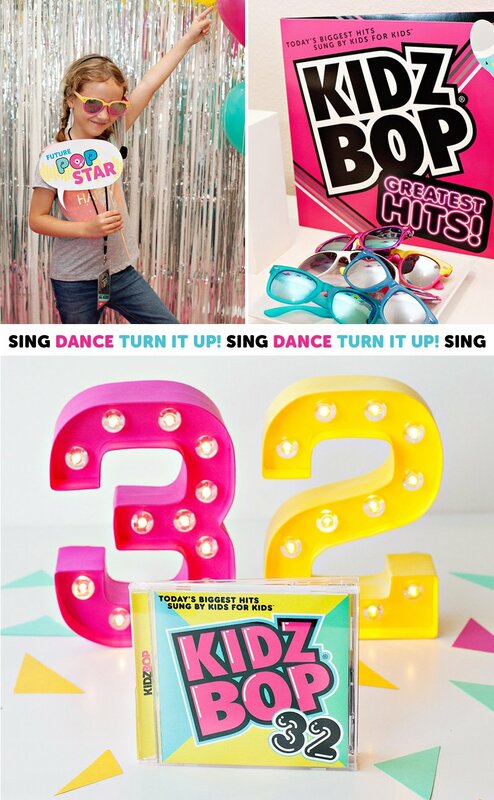 KIDZ BOP is also celebrating the debut of KIDZ BOP 32 right now, which comes out July 15th. This album includes an original KB song called “Life of the Party“, was just released TODAY! And if you’re looking for a fun outing, the KIDZ BOP Kids will be on their “Life Of The Party” tour for the rest of 2016. Find tour dates & more info here. 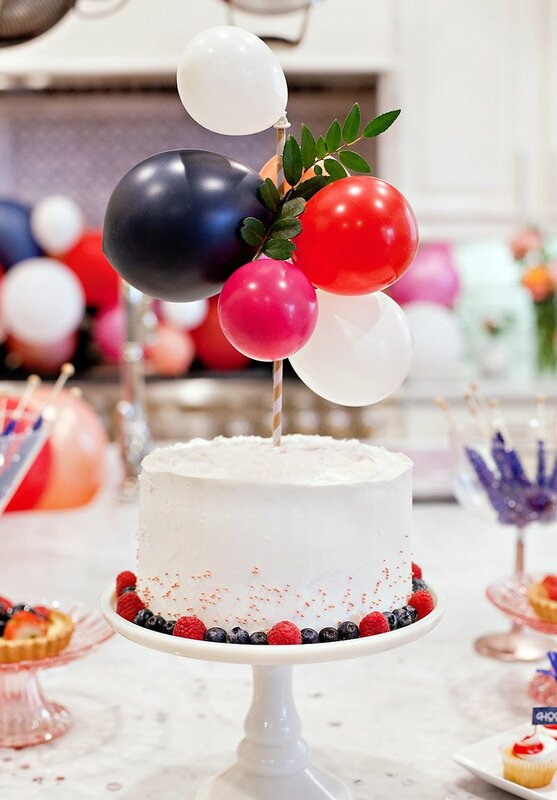 And now… onto the party inspiration! And if you have kids that are a little older, check out The Ultimate OMG Playlist, which is geared for kids ages 8-11. 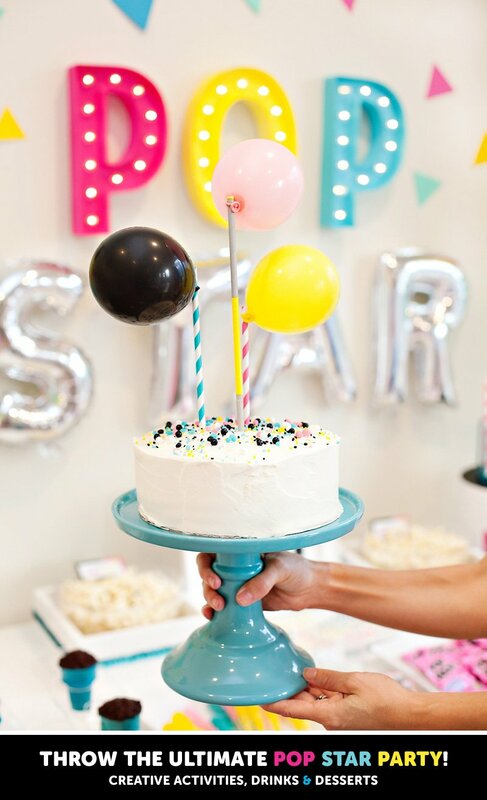 It’s important to make every guest at your party feel like a VIP! 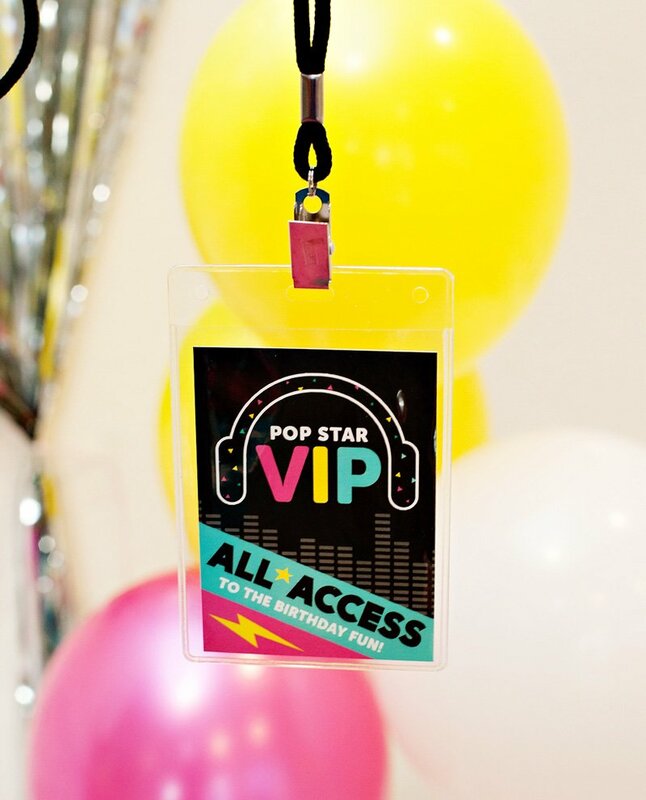 Greet them with printable “All Access” VIP Badges when they arrive, and use clear ID sleeves and lanyards to give the badges an authentic concert vibe. 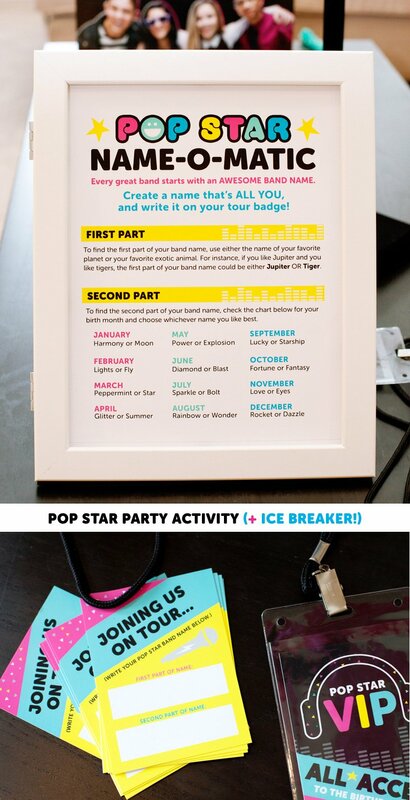 It’s fun to hear ALL the different band names that get created, making this a great ice breaker activity too! What would a pop star party be without cameras flashing everywhere, right?! 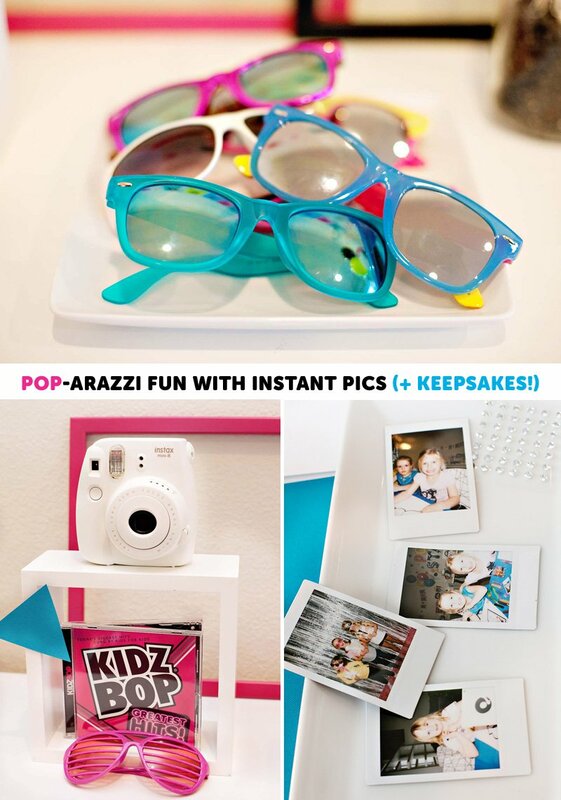 Make your pics extra fun with themed props for guests to use when they strike a pose! 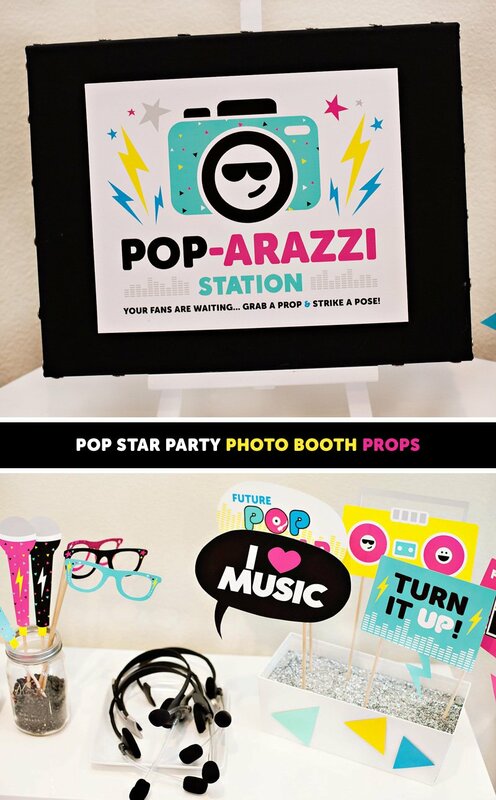 We set out inexpensive items like kid sunglasses and costume concert mics, and made playful stick props from printable Pop Star Photo Accessories hot glued to wooden dowels (which are available in packs at craft stores). Displayed next to the accessories were an 8×10 POP-arazzi Sign and I (heart) MUSIC Banner. Silver foil curtains and balloons make for super simple, yet effective POP star photo booth backdrop! I used 2 curtains here and simply taped them to the wall, then added colorful balloon bunches on each side. This same set-up works great as a “stage backdrop” for karaoke and lip syncing activities too. In addition to taking regular photos with our digital camera, I bought an Instant Film Camera that creates mini Polaroid style pics, and we let the kids play “photographer” too. I can’t tell you how much they absolutely LOVED this! My own girls thought it must be some sort of magical device… it was hilarious to watch the amazed looks on their faces as the pictures developed. I realized that they rarely see pictures printed out anymore – especially ones that appear in front of them instantly! 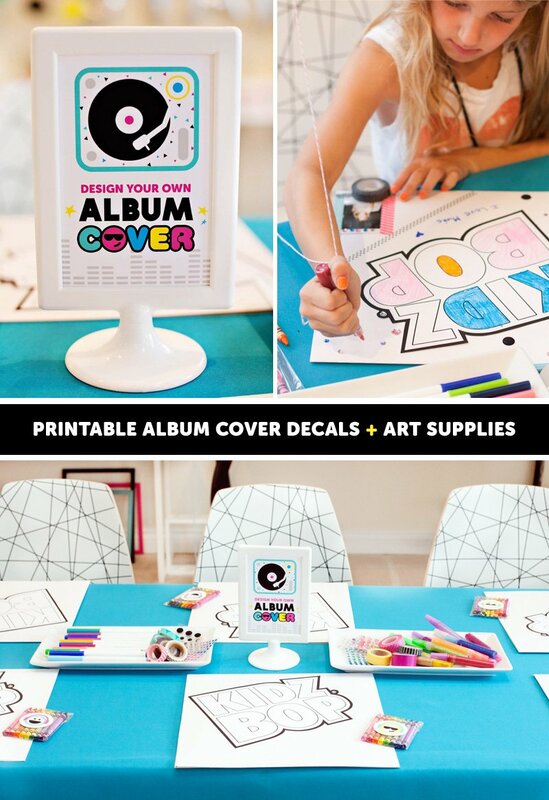 I ordered blank record jackets online, then printed large KIDZ BOP Logos in black and white and cut them out by hand. The logos were glued to the album covers to create a coloring template for the kids. Craft supplies like washi tape, glitter glue, markers, and rhinestones were placed in the center of the table to share. 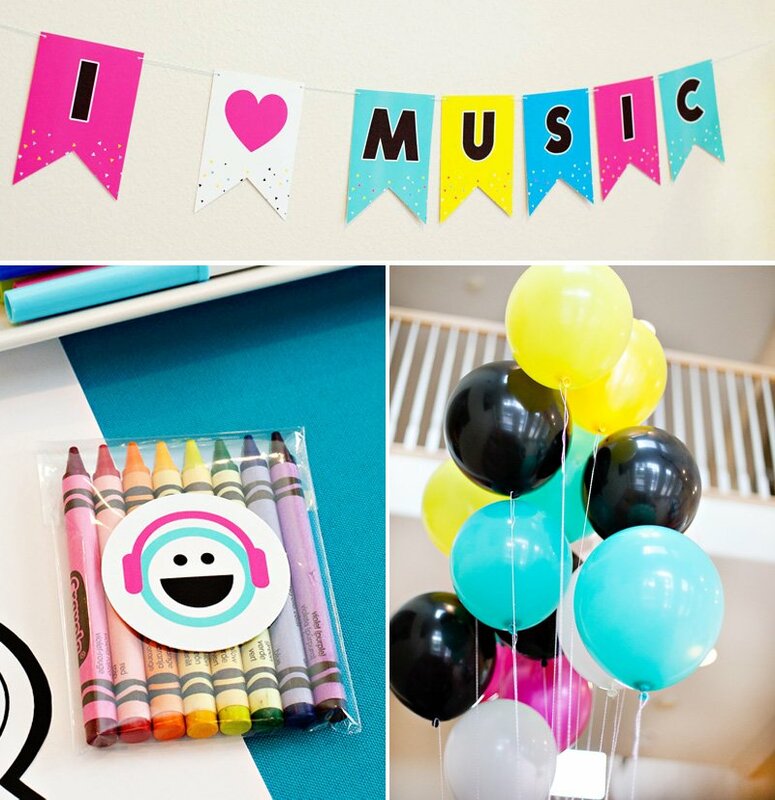 Each guest also received their own mini crayon pack embellished with a cute headphone-wearing party circles. You can download the Party Circles and 4×6 Activity Sign here. I always love a fun twist on a classic game, especially when it plays up the theme. 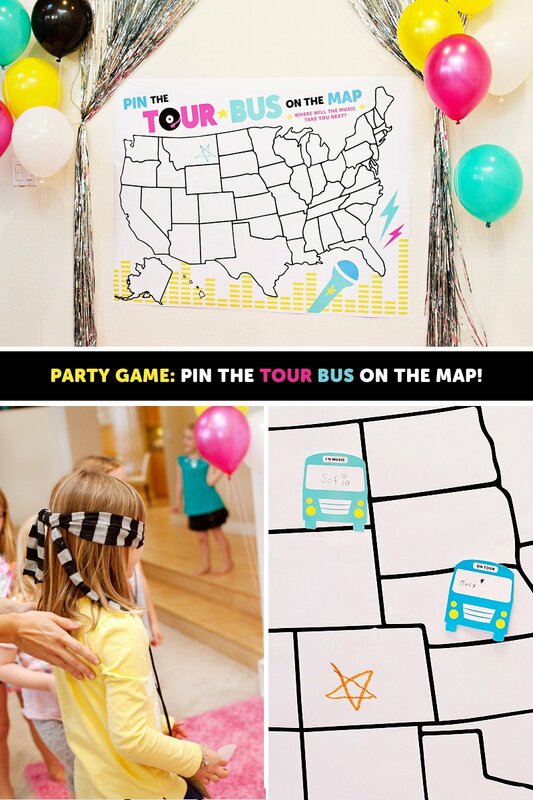 So instead of “Pin the Tail on the Donkey”, we played “Pin the Tour Bus on the Map“! You can download my 36×48″ Tour Map – and print it as a Color Engineering Print at Staples for less than $12! We had Tour Bus Game Pieces with large windows where each guest could write their name. You’ll also need to add rolled tape or a sticky adhesive dot to the backside of each game piece. The player whose bus is closes to the star wins! To play again, let the winner of the previous game put a new star on the map and start the game over. 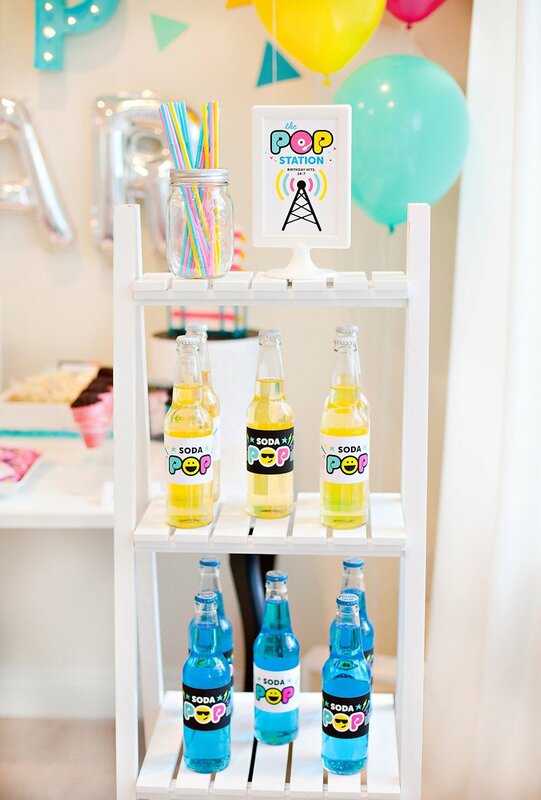 Including soda POP at a pop star party is kind of a no brainer, right? 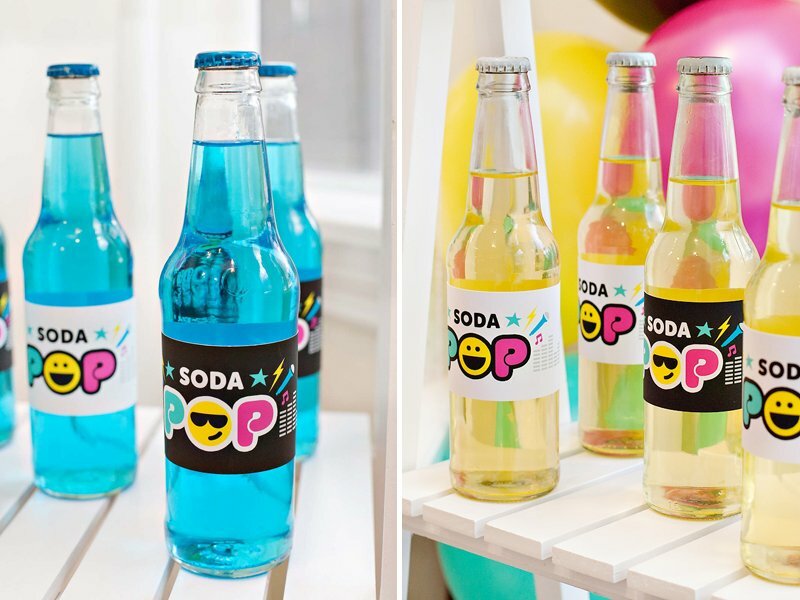 ;) I found bottles of blue and yellow soda, removed the labels, and designed Soda POP Labels to wrap around them. 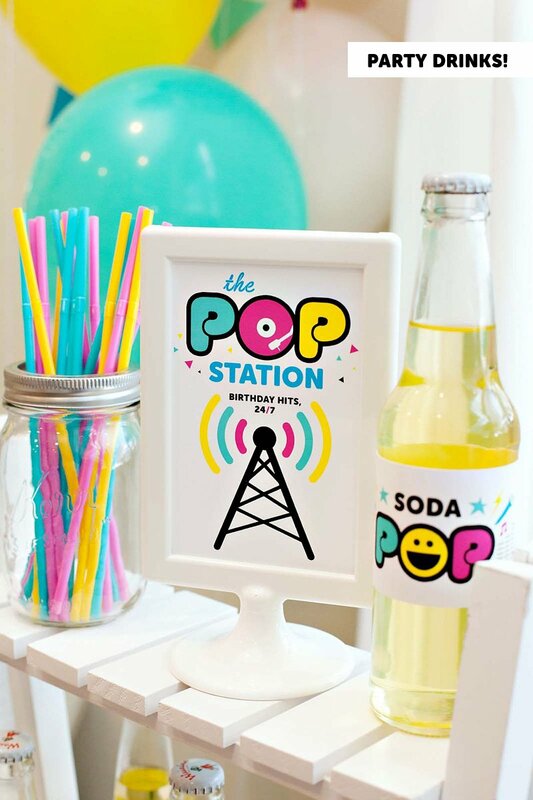 I couldn’t resist working “Pop Station” into this area as a play on soda pop + radio genre. ;) You can download the 4×6 Pop Station Sign here. 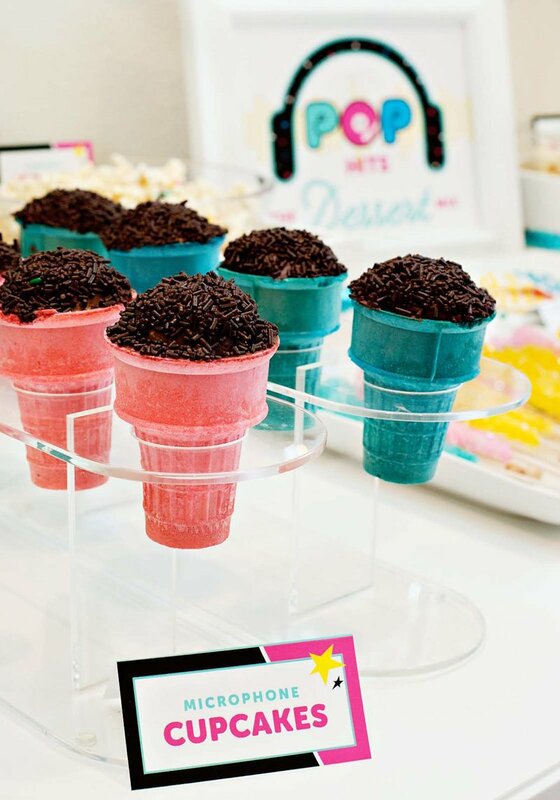 Next up… the dessert table! 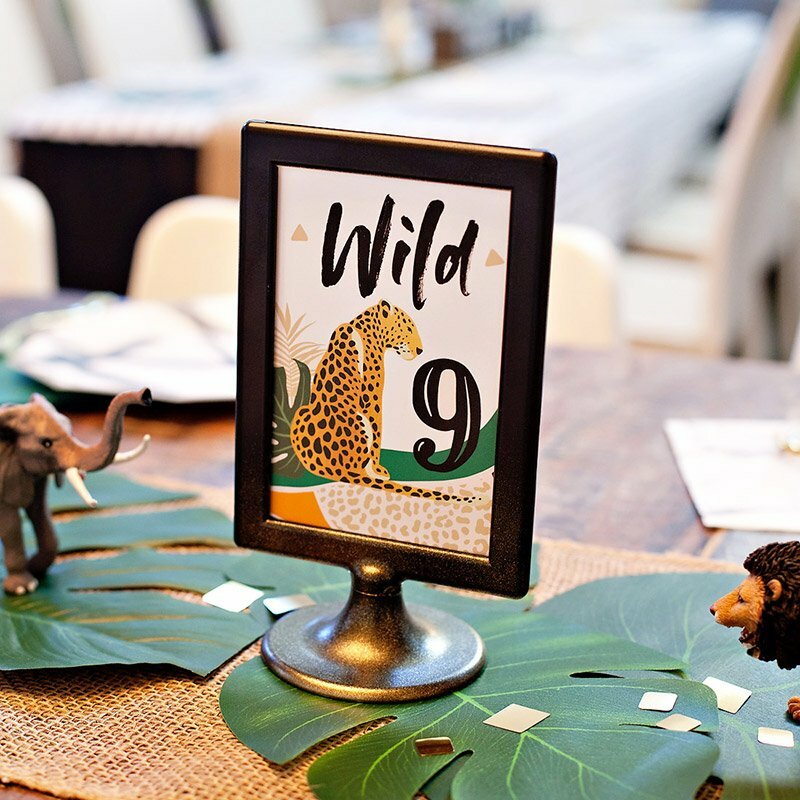 Because this post is already lengthy, I’m including just a quick peek at the dessert table here + links to download the 8×10 Sign and Dessert Cards in Pre-Filled and Blank. I’ll post additional images of the dessert table in a separate article soon! We sent guests home with “candy microphones” made from candy-filled tubes and printable Microphone Tops! I found the 6″ tubes online and filled them with a yummy custom-color Candyfetti™ mix. 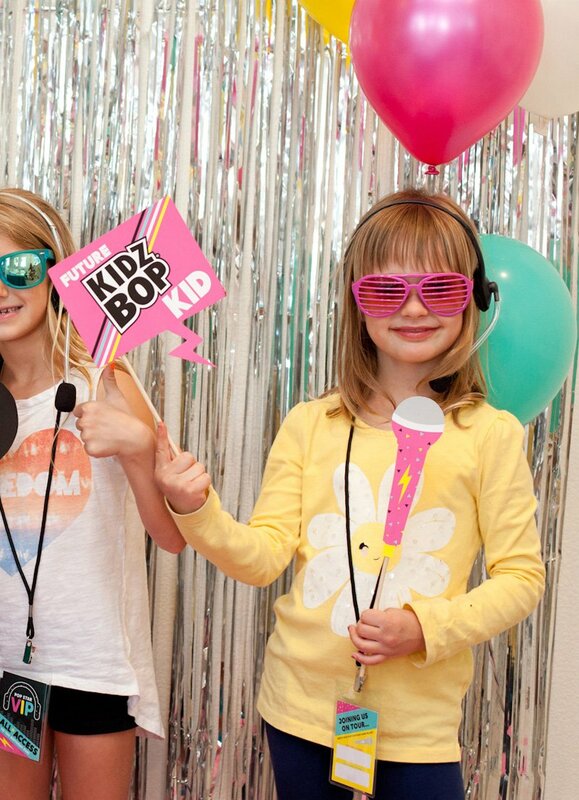 Disclosure: This is a sponsored post for KIDZ BOP, which records kid-friendly versions of today’s biggest pop music hits sung by kids, for kids. As always, all thoughts & opinions are my own. Thank you so much for supporting the companies that make it possible for HWTM to keep the creative content coming your way! That's a really great idea!!! Cool idea! What does the disc look like for Kidz Bop 32? These all really creative ideas! 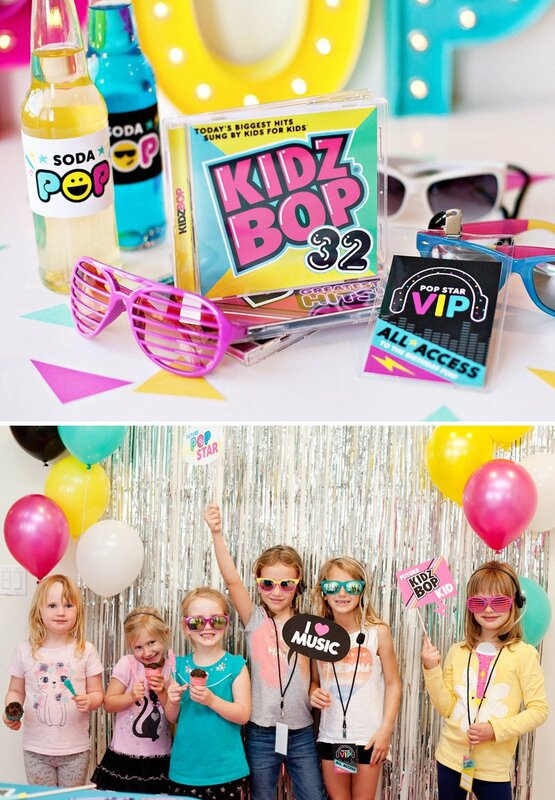 Go check out @HWTM_Jenn’s awesome #KIDZBOP party blog post: http://bit.ly/popstarpartykb ! I love this idea so much! This is awesome and thanks for showing us some really cool ideas and very exciting ideas that we absolutely LOVE thanks #KIDZBOP!!! We know how to show you how we party!! 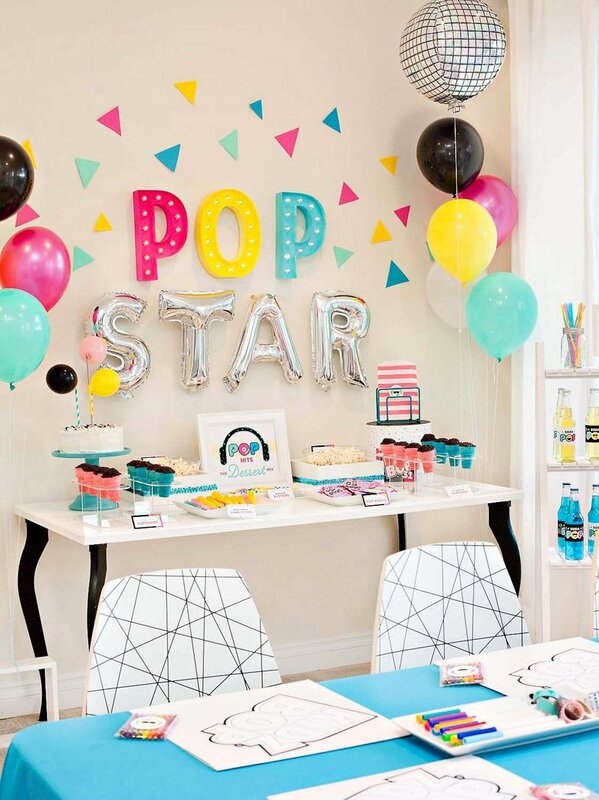 Congratulations on showing us how to throw a Ultimate POP STAR PARTY!! Make your kid feel like a superstar. Where did you buy clear ID sleeves and lanyards? 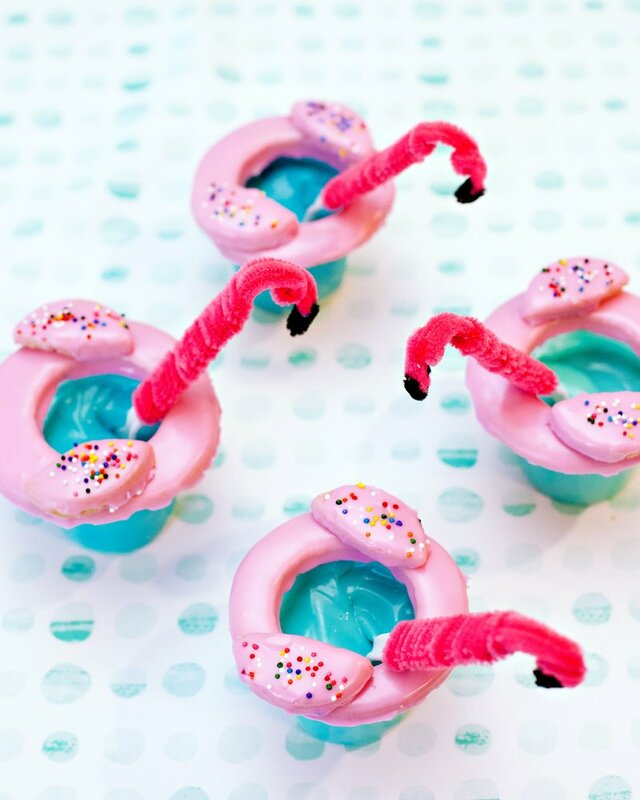 Hi Carolina – I bought the ones for this party at Staples, but you can also find them on Amazon! Not a problem at all! Everything else is fabulous and will save me so much time! Thank you for these wonderful ideas! My six year old daughter loves Kidz pop. Everyone was so impressed with the party ideas. 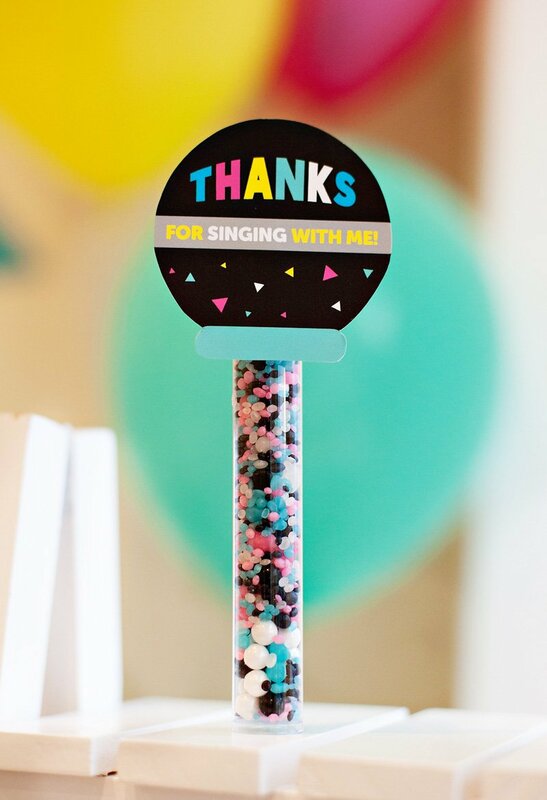 I actually used the colored long peppermint sticks from party city the the thank you microphones as it was cheaper that the tubes. I also made colored themed jello and out them in little clear plastic cups with lids for the dessert table. I wish I could upload pictures. But I couldn’t have pulled this party off without all the free printables you provided. Thank you thank you! I couldn’t have pulled this off without your ideas. This is awesome! 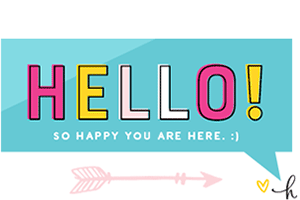 Thank you so much for all the inspiration, and the free printables. I am in the process of planning my daughter’s 7th birthday next month and she love loves Kidz Bop. We are incorporating a 30 minute hip hop class to the music at our party with a professional dance instructor, but my daughter is very crafty so we will definitely be designing album covers as well. Can you tell me where you found the crayons packaged in clear plastic? Thanks so much! 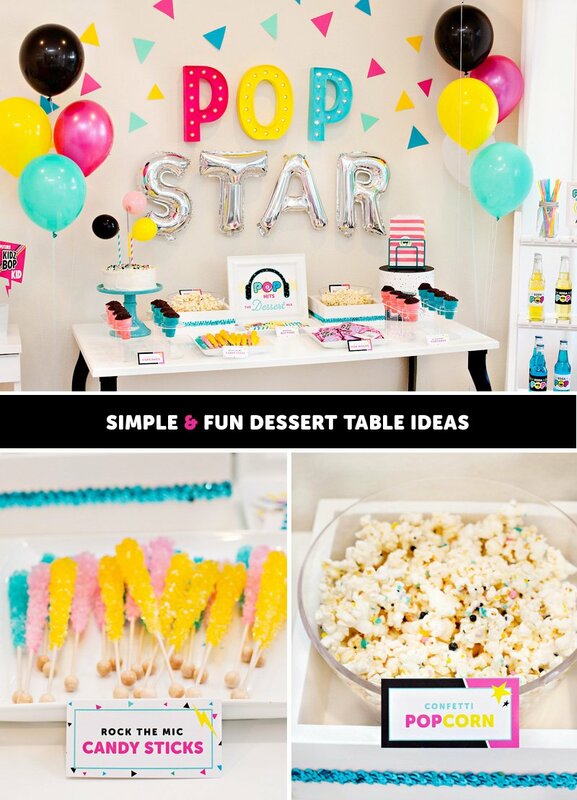 this is antoinette again, i ask you some questions before regarding the popcorn and i have one more questions rather one of the many questions i will ask as I’m planning my 7th daughters party, may i ask are the colored letters that says POP light ups? and where did you buy it? can you give an idea where can i get it? The “POP” marquee letters are actually individual letters that come in white – and then I painted them myself. The brand/product is called Heidi Swapp Marquee Love. I bought them at Michaels, but it looks like they don’t sell them anymore. I do see them on Amazon and on scrapbookstore.com: Letter 0 and Letter P. Hope that helps! Can you tell me where you found the blue and yellow soda? Hi! I love this so much. My daughter asked for a Kidz Bop birthday and I was dumbfounded on what I was going to do until I found this. Thank you so much for the inspiration. I was wondering if there is a matching invitation file that is editable? If not, I was going to have someone on Etsy create one that matches the theme but would love to be able to do it from home if possible! So happy you found some ideas you can use here! I actually don’t have a matching invitation available though – sorry about that! How soon would you need it? Jenn S. I would need the invitation by the end of this month. My daughter’s birthday party is May 12th. That would be awesome if you could provide one!!! Please let me know via email if you can. Thanks! How did you get Staples to print the map as a blueprint. I’ve called several stores and they tell me it can’t be printed as blueprint because it’s a pdf instead of an actual blueprint. They said it would have to be printed as a poster and would cost $30 instead of $12. 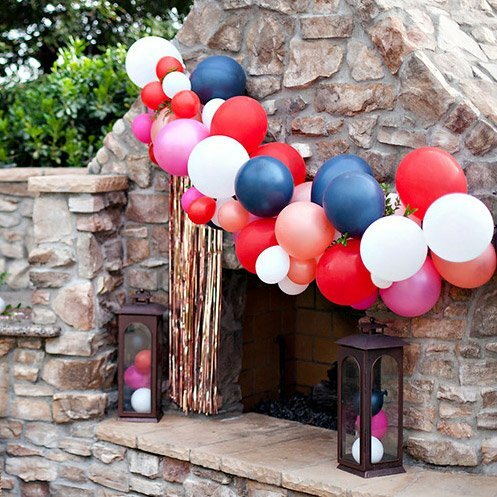 I really like this and would love to use it for the party! That’s so strange! I’ve never had an issue with it before and have sent several PDFs to print there as Color Engineering Prints. Not sure why that’s happening for you. :( I always use their online printing tool though (instead of calling them first) – so I just upload the file and send it to print myself with the Color Engineering Print product selected. Not sure if that’s the difference but it still seems like it shouldn’t matter to them either way. I’ve printed this way at both the Staples in San Diego where I used to live and at the one in Northern California where I live now. Hope it works out for you!